Team SonicPlayers, including UM-Flint Computer Science students Cole Rauh and Alex Latunski, at SpartaHack IV. 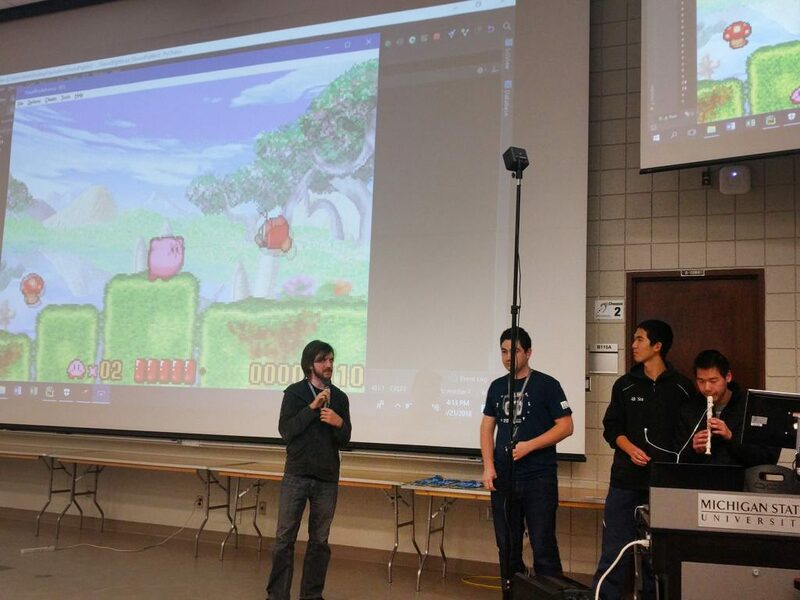 In January 2018 UM-Flint Computer Science and Mathematics student Cole Rauh led a team of coders to victory at SpartaHack: an annual student-run event hosted by Michigan State University that brings together “500 students of all skill levels and disciplines to get creative with tech, connect with peers and professionals.” His teammates included Alex Latunski, a fellow UM-Flint Computer Science major; Karl Zhu, a high schooler from Canada; and Michael Lin, an MSU Computer Science freshman. 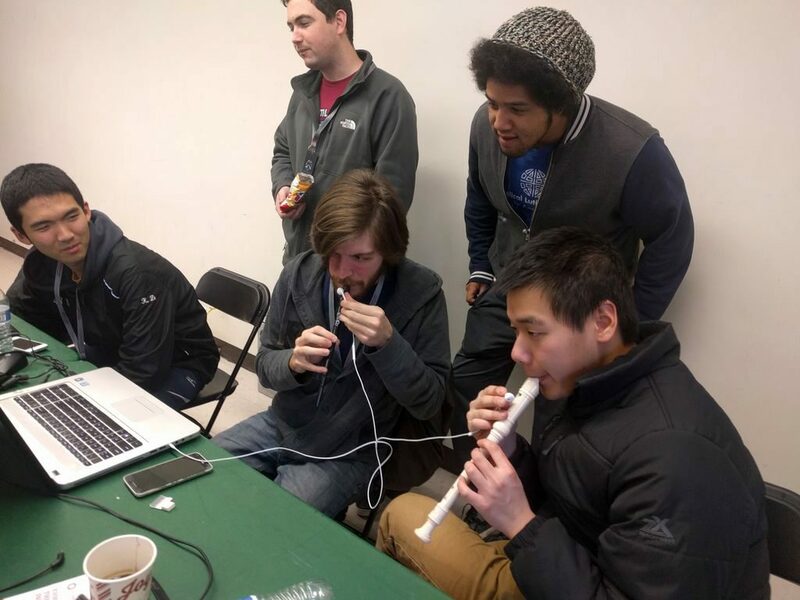 The team won first place overall in the competition for their application that allows a user to play video games by producing notes on a musical instrument. Read on as Rauh describes the competition in his own words. Spartahack is a weekend-long coding competition. You are given 36 hours, from midnight Friday to noon Sunday, to build a piece of software. You aren’t given a topic, the only real stipulation is that your entire project must be coded that weekend, no bringing in a partially finished project to work on. At the end of the 36 hours, all projects are presented science-fair style, with each team getting a table to set up your project. Judges and other attendees walk around during this time and your team demonstrates your project to them. After the expo, judges choose a top 10, as well as winners for several side prizes, such as most creative, best android app, and so on. The top 10 then give a short 2 minute presentation in an auditorium in front of everyone in attendance. After the top 10 presents, the winners of the side prizes are announced, followed by the winners of 3rd, then 2nd, then 1st place. Leading up to the event, we had no idea what we were going to make. While I was packing for the weekend, I saw a couple recorders that I had from elementary school. I thought maybe we could do something with them, so I tossed them in my backpack. During the drive there I thought about how we could use them. The first thing we’d have to do is read in the note being played into the microphone. Then we would have to process that to figure out which note is being played. From there I realized the number of notes you can play is pretty similar to the number of buttons on a classic video game controller, so I thought we could try using the recorders as controllers for old video games. I figured it had a pretty good shot at the most creative award, although I didn’t think it could get any more than that. When I got to the event I met up with Alex, who was the other student from UM-Flint, and shared my idea. He was a little hesitant about it but decided to go along with it. We had room for 2 more people on our team so we took on Karl Zhu, a highschooler from Canada, and Michael Lin, an MSU freshman. We set up in one of the work rooms, which quickly cleared out after we started squeaking the controllers. After a few hours we had it working well enough to play single player games such as Kirby or Pokemon. We decided that the next step should be multiplayer. If you plug headphones into a microphone port, they will function as a microphone (although not a very good one). We found that we could play one recorder into the left headphone and another into the right microphone and process the two ears separately. We taped a headphone to each recorder, using plastic fork tines to get them positioned just right. With this set up we were able to get multiplayer games like Bomberman working. Around this time, the constant recorder noises in the hallway were starting to attract several curious people. One of those people was Whitney, an employee of one of the event’s sponsors, Auto Owners Insurance. After speaking with her for a while, she offered to bring in her violin, so we could show that our technology can work with any instrument. Early Sunday morning she came in and worked with Alex to get the pitches set up and to teach him the basics of holding and getting a sound out of it. I came in about a half hour later and spent the entire morning just practicing the violin and just working on getting good enough at it to get enough of a sound out of it to move a character in a slow game. When it came time for the expo, we were given our own room to demo in, since our project was sound based and needed a relatively quiet space. We set up two tables, one with the recorders to show off single and multiplayer games there, and one with the violin to show our project can work with any instrument. Our project turned out to be pretty popular, with a near constant stream of people stopping in to check out the source of the squeaks. Team SonicPlayers demonstrates their app at SpartaHack IV. After the expo, top 10 was announced, which included us! We were psyched, as we never expected to do that well. We really only saw our project as a small toy, especially compared to the other brilliant projects being shown off. Each team in the top 10 is given 2 minutes to present and demo their projects. I started our presentation by saying that our project was to play video games using music. I then apologized for all the squeaking we made with the recorders throughout the event, before handing the mic to Alex. Alex briefly detailed what our project was and what it did, while Michael and Karl played the recorders to show off Kirby and single round of Bomberman. The audience got a kick out of watching them die to their own bombs in Bomberman. I then took the mic back and explained that our project works with any instrument, and thanked Whitney for providing us with a violin. We were closing in on two minutes, so I ended our presentation there. After all of the presentations finished, The organizers started awarding the side prizes. The only prize we felt we had a chance at was Most Creative, so we got our hopes up when the organizers got to that prize. They were quickly dashed, however, when the prize was awarded to a team called Fidget Skirmish, who made a game involving fidget spinners. At that point we believed we wouldn’t win anything, but were still proud to make top 10. Imagine our surprise when it got to first place and the announcer said “And first place goes to, drum roll please… SonicPlayers!” We were all in disbelief, with Karl even asking if it was a mistake. When it finally sunk in that we had won we were on top of the world! Congratulations to Cole Rauh, Alex Latunski, and their teammates! For more information on UM-Flint Computer Science, and the ways in which it prepares its students to make their mark in the world, visit umflint.edu/computer-science.